Collingwood's dominance in the midfield decided this match, allowing them to win the inside 50 count by 10 and scoring shots by nine. After copping some criticism to start 2017, Scott Pendlebury has been the best on ground in today's match. He has 32 disposals at 77 per cent efficiency, 11 contested possessions, nine tackles and six inside 50's, all teamhigh's. Darcy Moore has arguably had his best game in his short career, setting new careerhigh marks in disposals (17) and inside 50's (seven), and equalling his career-high mark of 10 contested possessions, set against Sydney in Round 20, 2015. After recording just 14 disposals in the first three quarters, Adam Treloar has already recorded nine disposals in this quarter, more than any other player on the ground. He also leads all players this quarter with three tackles. Geelong have won nine straight clearances to begin this term, despite the Magpies winning the hitouts eight to one. Both of Geelong's goals this quarter have come from Intercept Possessions in their forward half. The Cats average 2.8 goals per game from this source in the fourth quarter of their matches in the 2017 Season, ranked equal first in the AFL. Mitch Duncan and Adam Treloar are matching each other's excellent performance in this quarter, recording five disposals, 166 metres gained, two inside 50's and a goal each. Cats InterchangeBrandan Parfitt and is possibly out for the game. Treloar gets the first goal of the final quarter, and the seventh goal out of the last nine in this match for the Magpies. They have spent 65 per cent of the final quarter in their forward half. Collingwood six goals from 18 inside 50's in that quarter, by far their most efficient quarter in this match. It also matches their season high of six goals in a quarter, set against the Bulldogs in the second term of their Round 1 clash. Jamie Elliott kicks truly and the Magpies get their sixth goal from a set shot in this match. This is a new seasonhigh for goals scored from this source for Collingwood. Collingwood have a kicking efficiency 26 per cent higher than their opponents this quarter. 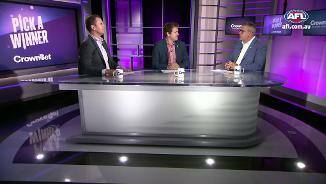 Over the first five rounds in 2017, they've lost this battle by an average of 2 per cent per game. Lynden Dunn just registered the first defensive oneon-one contest win for either side in today's match with that contested mark. Collingwood have won 9.4 per cent of defensive one-on-one contests with a mark, ranked second in the AFL in 2017. Cockatoo gets his second goal of the match to make up for Alex Fasolo's goal moments earlier. Geelong have scored from both of their Intercept Possessions inside forward 50, including that last goal to Cockatoo. Brandan Parfitt kicks the first goal of the second half, and the first Cats goal to be launched from defensive midfield in 17 attempts. The Cats average 3.6 goals per game from this zone, ranked second in the AFL in 2017. To start the third term, Collingwood are being far more efficient with their disposals by foot, going at 91 per cent efficiency compared to the Cats 67 per cent. Collingwood average a kicking efficiency of 64.2 per cent in 2017, ranked 14th in the AFL. After equalling his careerhigh of 43 disposals last round, Joel Selwood has almost been tagged out of the game by Levi Greenwood, recording just 27 metres gained, nine disposals, three kicks and zero inside 50's. Collingwood have scored 3.3 (21) from 14 chains launched in defensive midfield, compared to Geelong's 0.1 (1) from 15 chains in this zone. Collingwood average two goals per game from this zone in 2017, ranked 15th in the AFL. Collingwood have continued to show that they're one of the strongest stoppage teams in the AFL in the first half, winning both the hitout and clearance count by 10. However, they have only scored three more points than the Cats from this source. After getting his second goal for the match, Darcy Moore was seconds away from getting a third if not for the siren. He has found some form today, equalling his seasonhigh count for disposals (10) and setting a new season-high with four inside 50's. Lynden Dunn has enjoyed a strong debut for his new club in the first half, with five disposals, two score involvements and a behind, but more importantly keeping Tom Hawkins to just the one goal in the first half. Collingwood get back to back goals after recording four of the last five inside 50 entries. All three of the Magpies goals this quarter have come from Intercept Possessions. They average 5.4 goals per game from this source, ranked 17th in the AFL. Collingwood have not had a oneon-one contest as the attacking target in this match so far. 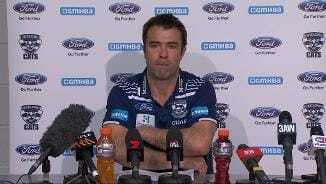 Geelong have five and have won two of them. Mitch Duncan almost had his first goal for the match before the Magpies were able to rush it through for a behind. That shot was his first ineffective kick of the match after nine previous effective kicks. He leads all players with 281 metres gained. 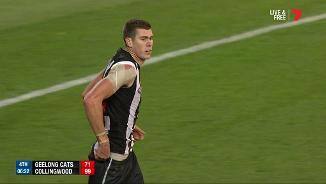 That goal to Tom Phillips comes from some immense forward half pressure by Collingwood. They have spent 92 per cent of the second term in their forward half, and recorded 17 uncontested possessions in this zone to Geelong's two. Tom Hawkins gets the first goal of the second term and his first of the match. 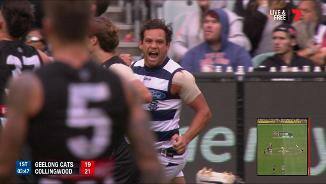 That goal was Geelong's first score from 11 chains launched from defensive 50. They average 3.6 goals per game from chains launched from this zone, ranked first in 2017. 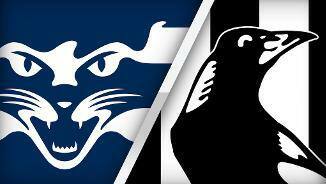 Collingwood have laid 12 tackles to the Cats six preclearance, however have only recorded one tackle to Geelong's 12 in general play. Andrew Mackie recorded a new careerhigh for disposals in a quarter (13), surpassing his previous best of 12 he recorded in the second term against the Demons in Round 19, 2008 and the fourth term against the Kangaroos in Round 14, 2010. Goals to Moore and Pendlebury have given Collingwood the biggest lead of the match so far. Since Geelong's last score, Collingwood have outgained Geelong by 314 metres, while kicking at 67 per cent efficiency in their forward half. 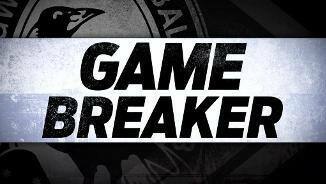 Collingwood are getting first use of the ball at the stoppages through Brodie Grundy's seven hitouts from 11 ruck contests, however the Magpies only lead the clearance count by one and the Cats have scored the only goal to be launched from a clearance. Geelong's pressure is already at a high level in the early stages of this match, as they almost have as many pressure acts (36) as disposals (37). Collingwood get a goal through HoskinElliott after six of the last seven inside 50 entries. Collingwood have scored a goal from just 18.1 per cent of inside 50 entries this year, ranked 18th in the AFL. Geelong are the most efficient scoring team in the AFL across the first five rounds of the 2017 season, averaging 126.3 points per 50 minutes of time in their forward half. Collingwood are ranked in the top four teams in the AFL over the first five rounds of 2017 for average differential measures in hitouts (third), hitouts to advantage (third), clearances (third) and scores launched from clearances (fourth). Tom Hawkins is in careerbest form to start the 2017 AFL season. He ranks first in the AFL with 12 goals kicked from marks, second for total goals, forward 50 disposals and tackles and equal third for forward 50 ground-ball gets. New recruits shone for both teams in the last round. Daniel Wells recorded eight inside 50's on Anzac Day, a gamehigh, to go with 24 disposals, and Aaron Black had 21 touches, kicked two goals, laid five tackles and took seven marks against St Kilda. 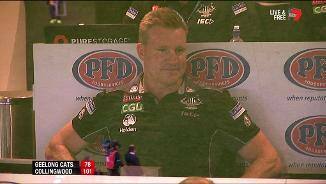 Since becoming Collingwood Head Coach in 2012, Nathan Buckley has won five, lost two against Geelong. In that time, Scott Pendlebury is the only player in the AFL to average 29 disposals, six marks, one goal and five tackles per game against the Cats. Welcome to MCG for the Geelong Cats v Collingwood Round 6 clash. SCOTT Pendlebury has bounced back from his Anzac Day shocker to lead Collingwood to an upset 29-point win against Geelong at the MCG. The Collingwood skipper described his effort against Essendon as his worst game in 10 years but despite having a five-day break, Pendlebury was everywhere when the contest against the Cats was at its hottest. He picked up 32 disposals and laid nine tackles as he helped the Magpies turn around a frustrating run of form to win their second game for the season 15.17 (107) to 11.12 (78). 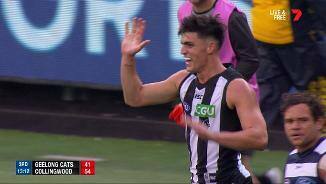 After failing to convert its chances for the first five rounds, Collingwood's confidence lifted midway through the third quarter when they began to hit the target. They kicked six goals in the premiership quarter to open up a match-winning lead, breaking the game open with the final three goals of the quarter. It was the first time Collingwood had won a third quarter for the season and came on the back of strong forward pressure and dominance around the stoppages. Geelong threatened to fight back but the Magpies held firm to defeat the Cats for the sixth time in the past eight encounters. The result will momentarily ease the pressure on Magpies coach Nathan Buckley, however a huge game against Carlton looms next Saturday at the MCG. Collingwood executed its plans well with stopper Levi Greenwood quelling the dangerous Joel Selwood who was coming off a career best 43 disposals in round five. Greenwood restricted the Cats' skipper to just three disposals in the first quarter giving the Magpies a psychological boost. The Cats moved Selwood forward at times, but he never imposed himself on the game finishing with just 17 disposals. Despite losing Travis Varcoe in the second half with hamstring tightness, the Magpies were able to maintain the rage with Will Hoskin-Elliott standing up to win big contests. Hoskin-Elliott created turnovers and kicked a goal while Alex Fasolo had his kicking boots on with two goals. Darcy Moore had his best game for the season, finishing with a career-high 17 disposals and two goals. Adam Treloar was tireless in the final quarter and Steele Sidebottom showed his class kicking a vital goal on the three-quarter time siren, while Taylor Adams laid seven tackles. Buckley was pleased the players finally earned some reward for effort. "And we were able to be efficient more often than not. We still left a lot of scores out there but that really put us, for the most part, in really good position on the field." By contrast Patrick Dangerfield – who has not displayed the same form since copping a heavy knock against Hawthorn on Easter Monday – was quiet with just 21 disposals and little influence. With Dangerfield not able to provide his usual dash, Collingwood led the Cats 10 centre clearances to two and Geelong's three highest possession winners on the ground were Zach Touhy (18 disposals), Tom Lonergan (17 disposals) and Andrew Mackie (16 disposals). Tuohy and Mackie ended the game leading the disposal count for the Cats and although Mitch Duncan and Steve Motlop battled hard they could not match the Magpie midfielders. 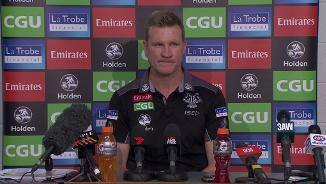 Scott said they planned for the way Collingwood played but could not execute the plans. "It was really disappointing the way we defended. We thought the template was quite clear," Scott said. "We were able to use the ball by foot very easily and we weren't able to get the same sort of thing our way so defensively it was a really poor effort…combined with some breakdowns in our method offensively but also just really bad fumbles and skill errors that were unrelated to pressure." In the end the Magpies once again kicked more behinds than goals but they were much more efficient inside 50 with 32 scoring shots from 59 inside 50s and also kicking goals from tight angles when they needed them. Brandon Parfitt did his hamstring midway through the last quarter and had to be assisted off the ground. It looked like a nasty injury for the youngster who had performed well in his first season. Scott said it was a "serious" hamstring injury and the first year player would be given whatever time is required to rehabilitate strongly. "The feedback from the medicos is that it is obviously a significant hamstring but until they scan it they won't have clear direction," Scott said. Travis Varcoe left the ground with hamstring tightness midway through the third quarter and remained on the bench. It will be scanned during the week to determine whether any damage has been done with the Magpies unwilling to risk him by bringing him back on. Collingwood faces a huge game against arch-rivals, Carlton, at the MCG on Saturday with both teams having the chance to keep in the finals hunt with a win. Geelong heads up to the Gold Coast with the spotlight on how Gary Ablett performs against the club he won two premierships with and the one he hopes to return to one day.